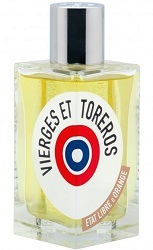 Almost ten years have passed since Etat Libre d’Orange released Vierges et Toreros.1 I've never come across it in a store and no one ever gave me a sample of the fragrance. The only reason I just smelled it is that I got a tiny vial of the perfume along with the recent Etat Libre d'Orange Attaquer Le Soleil Marquis de Sade release. I ignored Vierges et Toreros all these years because bullfighter images aren't my thing, and people I trust gave it lukewarm reviews. I never added it to my to-try list. Mistake! Where were we? In Seville? In Puerto Santa Maria? 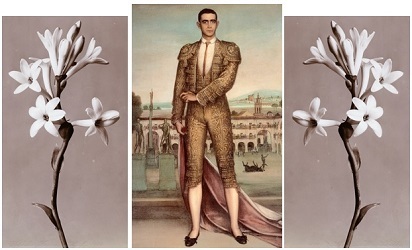 Definitely somewhere in Andalusia, where the stature and pride of men are compelling. The arena was flooded with sun and the clamor of the crowd rose from the tiers like an offering. On this particular Sunday in the month of May, the combat to be delivered did not have the aim of putting a bull to death. The intention was a sensuous ritual act: to confront animal-like notes with the influential power of a flower, one of the most odorant in the vegetal world, the tuberose. Wood, musk and costus, in daring, unreasonably abundant proportions, would once and for all bite the dust in this arena dedicated solely to the glory of men. In this openly sexual confrontation — me the woman, you the man — one of the most blasphemous of men’s perfumery, the purity of the tuberose is falsely innocent so that in appearance only, these macho reputed notes seem to be the only ones victorious. But smelling it tells a completely different story… the nose instinctively knows who the victor is. Vierges et Toreros starts with the aroma of honeyed leather (the "honey" veers close to orange blossom more than beeswax or food). Ylang ylang and pepper appear next and mark the path to spicy tuberose; the tuberose is neither soapy nor indolic, but rich and creamy: pure. Vierges et Toreros' spices burn off and tuberose takes center stage (or "ring" as the torero imagery would have us believe). What often happens with many tuberose perfumes as they develop on skin, their transformation into pedestrian suds or sheer/bland "white florals," does not happen on me with Vierges et Toreros: it has a long-lasting tuberose gutsiness, wearing down to soft leather-hay-tuberose-costus. Vierges et Toreros reminds me of a (male) perfume relative of L'Artisan Parfumeur Séville à l'Aube. My love of tuberose started with real flowers, not with its representation in any fragrance, so I've most often been disappointed with tuberose perfumes. Apart from bouquets and blooming tuberose plants in my garden, I've had to satisfy my cravings with the occasional candle or soap (it's hard to find a non-soapy tuberose soap, let me tell ya). Frédéric Malle Carnal Flower, Robert Piguet Fracas, Serge Lutens Tubéreuse Criminelle, at least their current formulations, are fun at first, but never satisfy me in the end; I can't wear any of them. Vierges et Toreros is different: thanks to leather, nutmeg/pepper, costus/musk, it never turns soapy or feminine on me. At the end of 2016, I find myself buying and yearning for an outrageous number of perfumes! I am a torero of sorts myself this year — holding my cape before me to obscure all the perfumes I want to buy (I've been "bad" this year). My arduous, but bloodless, battle with perfume lust does have a victim: my wallet. Etat Libre d'Orange Vierges et Toreros Eau de Parfum is $85 (50 ml) or $149 (100 ml). For buying information; see the listing for Etat Libre d’Orange under Perfume Houses. Note: top images via Wikimedia Commons: Tuberose for the photographic herbarium of the Museum of Arts and Crafts Hamburg, 1900; and Cordovan bullfighter Rafael González Madrid (1880-1955), better known by his nickname "Machaquito" by Julio Romero de Torres. I am glad you succumbed to the charms of this one.It’s a favorite ELdO in my little collection.Have you tried Charogne? Yes,yes I do!People always say Charogne is the “older Cougar teaching the young boys how to properly tango”,I’d rather say:Two guys sit at a bar,the Torero and his young understudy.There’s a mountain and a winter training school ahead.An an intimate tent for two….???? I just got the sampler set from Etat at Sephora. Mad this is not included! Chandler…did you get the new Attaquer le Soleil? Oh Kevin. I read the first sentence and I knew this was your writing even before I saw the name. You have no idea (thank heaven) how rough a day I have been having, and your funny, beautiful review has lifted my spirits so very much. Thank you. As for the darn scent, I must admit I am a tuberose girl. The note just seems to blossom on my skin, in almost any variation and guise. This particular scent seems to be particularly sensitive to the individual wearing it, since others, like yourself, seem to to end up with soaps or something unclean (in a bad way). Does it make sense for someone who already has too many tuberoses to seek this one out? Dilana, first — thank you! And I do think you should try it…this is a quirky tuberose scent … a very interesting take on it. I’m pretty sure I have a sample somewhere, I’m running of now to check. I do love my tuberoses…as you, I know the real stuff, on good summers (not this last one) I have them in bloom on my balcony. Bee, it was a sensational tuberose year here in Seattle…but we lucked out on marvelous bulbs this year, too. I’ve been bad this week with buying several new perfumes…your review made me want to add another! Filomena…I can’t bring myself to say how many bottles I’ve bought in the last 8 weeks. All I smell when I put it on is nutmeg. It really dominates!!! Kev, another person who I let wear it said the same thing, and I do love nutmeg. Have you told Donnatella yet? Inquiring minds want to know what you bought? Hajusuuri…I am IGNORING Donatella; I may fess up in my “best of 2016” piece…but for now I’m looking at all the new “faces” in the cabinet and making pretend they came here on their own for the Northwest climate. HA! I seem to recall that Joe from Santa Barbara liked this one. Noz: you have a great memory! I did a quick search online and he said he loved this WaaaaaaaaY back in…2011! (in my Secretions Magnifiques post).